So Nancy and I had a sewing date today. She did a great job coming through with a sewing project (and a completed project!) Me? Notsomuch. I spent two hours cutting fabric. I am working on a pair of lounge pants. My first article of clothing, and I learned today that I don’t read instructions very well. For instance, I should have bought 2 1/2 yards of trim. Not 2 1/2 yards of fabric FOR trim. Yep. I have 2 1/2 yards of very pretty fabric (that may turn into pants, you never know.) And I still need to buy trim. Oh, and start sewing the pants. 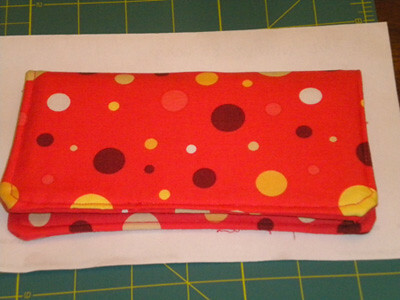 After I cut the fabric for the pants, I decided to cut fabric for a checkbook cover. 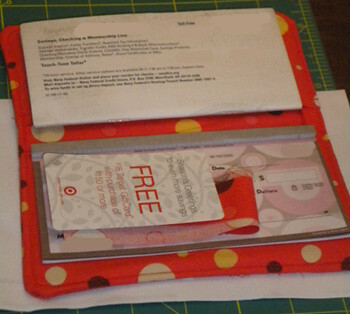 Since I made the business card holder, I had the idea that I could make a checkbook holder – and more people have a need for covers for checkbooks, versus business cards…right? Tonight, I sat down with my lovely sewing machine, and went town. And sewed a few pieces on backwards. After 30 minutes of ripping the seams, I put it together correctly and I was successful! With no pattern to follow!! I’m beyond excited and can’t wait to make more – and maybe even sew my lounge pants together. Hi Jaime! We’re on Tinsel Vixens together and I just wanted to say hi. Good job on your project! I have a sewing machine and took an intro class and have yet to make anything except what I made in class! Hope I can be like you!